Sixty three percent of online customers told that they are more likely to come back to a website which provides live chat support, as per marketing research firm Forrester. Simply offering chat support services to customers does not guarantee all these benefits. You have to work smartly and need to apply multiple techniques to generate maximum perks from this process. Various companies also choose to outsource chat support as agents in contact centers have sufficient experience in handling customers. Check these surefire chat support tips that will definitely help you in becoming a trusted brand among customers. Before beginning the chat session, the customers must be asked to answer few basic questions through a pre-chat survey. These questions will aid in getting preliminary information like their name and nature of query etc. This will definitely prepare the agents to answer in much effective manner during the chat session. Make sure to avoid more than three questions in this survey as customers may get frustrated due to too many questions. These forms of surveys are crucial for analyzing the performance of your agents. You can integrate an automatic post chat survey consisting of basic questions that reveal the experience of customers. This will aid in improving the key areas of the chat support process. Customers should also be allowed to add feedback or suggestion through an open-ended message option. Your customers take you more seriously if you keep a formal approach whenever they make a contact with you. And usage of slangs may reflect negative image related to your customer support department. Therefore, purging off the slangs from live chat support is the sanest thing while providing chat support. Sarcasm is another form of the conversation which should be kept away from live chat as it may stimulate the anger of the customers. Multiple chat support systems have the facility of sharing files with customers during live chat communication. You can exploit this feature wisely to improve customer satisfaction levels. Best strategy is send screenshots which have instructions related to query of the customer. You can also send images to customer to provide better details related to a product or service. 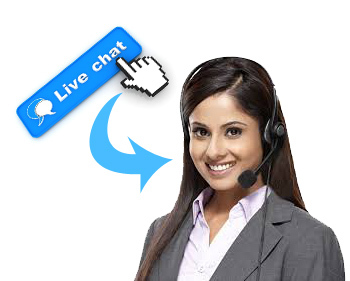 The best feature of live chat is that customers don’t have to know that you are unable to solve the query. To utilize this feature, you can immediately ask your colleagues or team leader about the solution. You can even transfer the chat to these concerned people immediately without telling the customers. Offering 24 x 7 customer support services has become a norm in this consumer-driven market. Customers can come with query at any time of the day (or night) while browsing your website or while facing an issue with the product. There are chances that you may miss potential customers due to chat unavailability. Therefore, it becomes imperative to provide 24 x 7 customer service through this vital medium. In case you lack resources to provide support for more than 8-10 hours, do not forget to integrate email support in the chat support. This will ensure that you receive the queries in the form of email even if you are not present for live chat. Rather than just guessing the type of query that customer will present, agents can utilize the power of typing indicator. Through this technique, you can actually see what customers are typing on the screen. This will prepare you to answer the query in best possible manner that matches customer’s expectations. Very often, the companies rely on scripts for communicating through channels like chat support. This habit is seen mainly for greetings and responses. But is it the right method? Actually, it is not! Scripted answers sound quite robotic which invalidates the point of having human agents for the service. Therefore, agents must add flexibility in their responses to sound more lively and enthusiastic. This technique is often recommended for departments like marketing or website designing to predict the response of customers. But it can also be applied effectively for catering different types of customers through live chat support. Simone is a 40 years old lady who works in a retail store. She is a divorcee and prefers to stay with her kids on weekend. She hates when her time is wasted during unimportant activities. She likes to help people which are part of her personal and professional life. Creating multiple personas using fictionalized characterization is quite an interesting idea which can help you in dealing with customers in a remarkable manner. You can add colors and symbols to the chat messenger that match with the theme of your business. You can also put your logo of your firm on chat window which will hint the customers that you take the chat support process quite seriously. All these techniques are definitely going to turn your chat support into portal of success. You can also opt for customer service outsourcing as the executives of customer support service providers are well-versed in all these techniques.